My kids complain a lot. I mean probably not anymore than normal kids but it still seems excessive. From the wrong color cup, to the wrong seat at the table, to the wrong fill-in-the-ever-loving-blank. It’s always something and sometimes it just gets to be a little too much and you have to push back. I’m sure you can all relate. 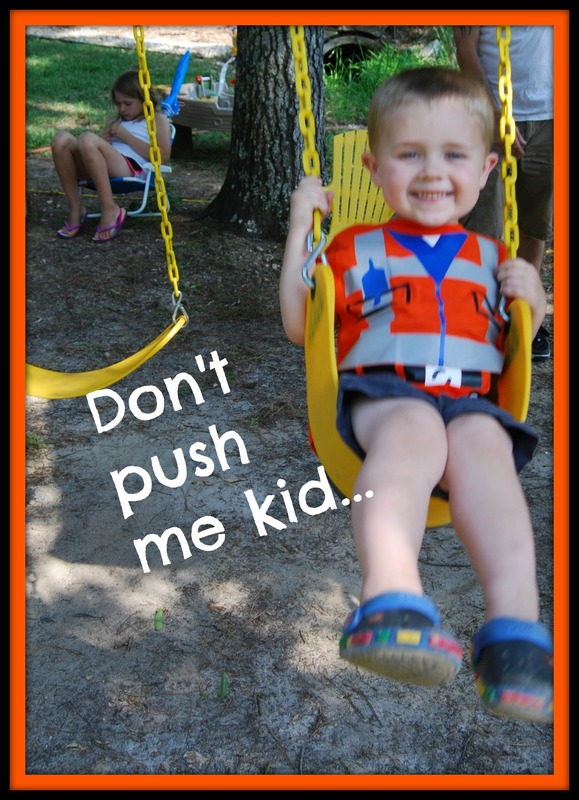 One of their chief complaints is that “Mommy doesn’t push as good as Daddy” on the swings. This one, for whatever reason, really gets under my skin. Maybe it’s the fact that I’m preoccupied with such nuisances as “safety” and “well-being” I don’t know. Maybe it’s the fact that I’m sick and tired of always being the “responsible” one. Or the “fun-sucker” as my husband so lovingly refers to me. Well this weekend it just got to me. It was one of those “anything you can do I can do better kind of moments”. We were out back on the swings- just me and all 3 of them as the hubs was at work. I was single-handedly jumping from one child to the next and back again when the whining started. So I started heaving them as fast as I could. Going higher and higher and higher. The squeals of delight echoed through the neighborhood. I was relishing in my victory when I noticed that Meeny (the 4 YO) suddenly got very still and very quiet. I paid little attention to this and continued down the line pushing Eeny (6 YO) and Miny (1 YO). When I came back to Meeny I gave him another HUGE push sending him up to the sky. As he reached the peak he exploded into a violent burst of projectile vomit. Eeny screamed as I lunged to try and stop the gauntlet of puke as he swung back and forth showering everything in his wake. I couldn’t quite get the timing right as I chased the swing back and forth trying futilely to stop him. The whole time he is spewing vomit in a violent arc back and forth across the yard. I mean The Exorcist has got nothing on this kid. Nothing. I finally managed to use my body as a battering ram and forced the swing to stop. At this point he was covered, I was covered, the dog was even covered and the wretching showed no signs of stopping. Finally it stopped and we froze for a moment in shock and awe and the violence that had befallen us. I was able to get him off the swing and over to the water hose to spray us both down. I stripped him naked right in the backyard and began spraying him from head to toe. It was at this moment that I looked up to see a group of golfers frozen in time staring at us mouths agape and horridly disgusted looks on their faces. [I guess I should mention we live on a golf course.] I didn’t even bother to wave or speak or offer any type of explanation. Their expressions said it all. I can only imagine the conversations at the club tonight as they recount the harrowing tale on hole #15. When I got Eeny, Meeny and Miny inside and got everyone cleaned up and changed. Meeny looked up at me his lower lip quivering and his face still green with motion sickness. I can’t decide if I’m proud of myself for finally showing them that I can push just as good as Daddy or feel bad for inducing such a horrible experience. Maybe a little bit of both. But I know this: I will never hear “You don’t push high enough” again. He has the stomach of his father. Dad and I just laughed and laughed at your post and marveled at your writing abilities! May I remimd you that my name probably could have been “fun-sucker” some years back while dad was the hero. I think it goes with the territory! Poor DC. I couldn’t get thru reading this without first gasping and then bursting into laughter. HAHAHAHAHA! WHEN DID HE EAT CARROTS??? You are hilarious, that sounds like it sucked! This. Was. EPIC! (From a fellow “fun-sucker” mom!!! I have laughed at your descriptions of parenting truths til my belly hurts. You make day every time I read. I just found this from one of your other blog posts I saw on FB and had to comment!! When my oldest was probably between 6 and 8 (I’ve got 4 kids, and said child is now 16…I can’t remember what I ate for breakfast, so, yeah.) we were at the park. It was a nice, summer day. There were 1000 people there. She was swinging. I thought I would be the super cool mom and introduce her to the world of underdogs. I succeeded in swinging her exceptionally high, exceptionally fast….which caused her to fall to the ground exceptionally hard in front of quite an audience. Thankfully, nothing was broken but my ego. The best. The very best. I have almost 21 year old triplets, and I was always the freaking fun sucker. Love this. Absolutely love it. Write on. It’s not that you could not… it’s that daddies have a different level of sophistication when it comes to pushing limits… mommy tried to push to hard… and resulted in going too far… so yes, the fact remains, somethings he CAN do better than you, such as using daddy intuition to push boundaries, but not overdoing it… mommies are notorious for not having “situational awareness”… no wonder they puke for mommy and not for daddy. Daddies are different, and not better than mommies, but reading about a mommy trying to replicate is just the height of insecurity and lack of faith in the daddy. Some things daddy just does better…. no hate, no misogynist, no privilege… just fact.